#1 BEST VEGAN PROTEIN – POWER PACKED – All Natural Raw Plant Protein. Ideal for Vegetarians and Vegans. Helps digestion and gut health. RICH NATURAL SOURCE of SUPPLEMENTS – Omega 3 Essential Fatty Acids, Full of Antioxidants, Iron, Fibre, Phytonutrients, Calcium, Manganese, Magnesium, Potassium, Phosphorus, Copper, Carbohydrates, Zinc. All the naturally active plant vitamins and minerals that are readily absorbed into the body for a healthy heart, improved circulation and great for hair, nails, skin and muscles. ENERGY BOOST – Source of slow release carbohydrate energy. Ideal for busy people, athletes and runners. Great added to your favourite protein shaker energy drink after workouts. Boosts your stamina throughout the day. PREMIUM QUALITY – Certified Organic by the trusted Organic Food Federation. High quality seeds free from sugar, gluten, wheat, dairy, soy, artificial fillers, colours, binders, additives, preservatives, chemicals and is non GMO. VERSATILE, EASY TO USE – Simply add to your favourite smoothie recipes, cereals, yogurt, salads, biscuits, bread, soups, cakes, desserts, ice cream and drinks. We are confident that you will love our Chia Seeds and all the added health benefits of this super seed. Order now with confidence or your money back guaranteed. Click the BUY button now. Enjoy the super seeds and stay healthy! Nutri Superfoods Premium Whole black RAW Chia Seeds are 100% Organic. Chia seeds are tiny black seeds that grow natively in South America. Versatile and easy to use, Chia is the ancient Mayan name for strength. They are loaded with nutrients that are important for your body and brain and are amongst the healthiest foods on the planet. Don’t be fooled by its tiny size! These tiny seeds pack a powerful nutritional punch and are the best source of complete plant-based protein. Organic Chia is high in Antioxidants. They fight the free radicals in our body that contribute to ageing and serious diseases. High in Omega-3 essential fatty acids too, they are nutritionally dense in calcium, magnesium, phosphorus that are essential for healthy bones. 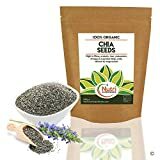 Chia seeds are an excellent source of plant Protein that makes it ideal for vegans and vegetarians. • Fibre: Best source of fibre -11g. • Protein: An excellent source of protein, especially for vegans and vegetarians – 4g. • Fat: High in Omega-3 & 6 Essential fatty acids – for improved metabolic health, lowers cholesterol and improves heart health – 5g. • Manganese: Supports Thyroid function and regulates blood sugar levels – 30% of the RDA. • Magnesium: For improved circulation, relaxes muscles, strengthens bones – 30% of the RDA. • Phosphorus: Important for bone health, cellular repair, optimized chemical reactions and proper nutrient utilisation – 27% of the RDA. Enjoy the naturally active plant nutrients that are readily recognised by the body and easily absorbed for maximum benefit! Buy the Best! Go natural, Be healthy and Look younger. VERSATILE AND EASY TO USE – Nutritious raw dark chocolate ingredient. Simply add to recipes for cooking, baking, cereals, porridge, power smoothies, protein bars and shakers and hot chocolate drink. Sprinkle on ice cream, coffee and cappuccino or anything that needs a rich, raw, low calorie chocolate taste. We are confident that you will love our Raw Organic Cacao Powder. #1 BEST RICH NATURAL SOURCE of SUPPLEMENTS – Omega 3 Essential Fatty Acids, Iron, Protein, Zinc, Phytonutrients, Magnesium, Manganese, Calcium, Copper, Vitamins A and C, Fibre, Sulfur, Zinc and Serotonin to improve mood. Plant based natural vitamins and minerals that are easily absorbed into the body for maximum health benefits. POWER PACKED NUTRIENTS – Increases energy with over 300 healthy compounds. Includes theobromine and various polyphenols like flavonoids. Contains the HIGHEST source of ANTIOXIDANTS – more than red wine and up to 3 times more than green tea. Improves heart health and Immune system..
VITAL FOR HEALTH – Kosher, Ideal for Vegetarians & Vegans. Free from Sugar, Gluten, Dairy, Soy, Wheat and Yeast. PREMIUM QUALITY – Arriba Nacional Theobroma Cacao (Cocoa) beans, “Food of the Gods” are grown in the rich soils of Ecuador. Certified Organic by the trusted Organic Food Federation. No artificial fillers, colours, binders, additives, chemicals or preservatives and is Non GMO. Order now with confidence or your money back satisfaction guaranteed. Click the BUY button now. Enjoy! 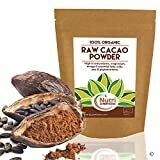 Nutri Superfoods Premium Raw Cacao Powder is 100% Organic. Our Arriba Nacional Cacao Bean is grown in the rich soils of Ecuador. The best Cacao beans are harvested, broken apart and left to ferment and dry before being washed, broken into small pieces called nibs, then cold-pressed to remove the fat (cacao butter). The remaining part of the bean is used to produce raw cacao powder. 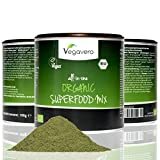 Recently recognised as a highly nutritious Superfood, it is a versatile ingredient for making power smoothies, raw chocolate protein bars, hot drinks, cakes, desserts, ice cream and anything that needs a rich chocolate flavour. It’s Kosher and ideal for Vegans and Vegetarians. It is free from Sugar, Gluten, Dairy, Wheat, Yeast, Soy, Preservatives and is non GMO. • Magnesium: One of the top 10 ranked superfood to strengthen bones, relax muscles and improve heart health. • Protein: High in vegan plant protein with 12.7 g supplying 8.6 % of the RDA. • Calcium: Essential for strong bones and teeth. • Vitamin C: Supports the immune system and relieves exhaustion and stress. • Iron: To oxygenate the blood and reduce fatigue. An ounce of the Raw Cacao has 6% of the recommended daily iron intake. • Antioxidant: Rich in flavonoids to fight free radicals and improve the absorption of Vitamin C and Iron. • Fibre: With 13 grams per 1 ounce. Helps to lower blood cholesterol and keep bowels regular. • Mood Improver: Contains many Phyto-Nutrients including Theobromine to improve mood and make you feel great! Enjoy the benefits of this naturally active raw, vegan chocolate ingredient. Buy the best! Go natural, Be healthy and Look younger!